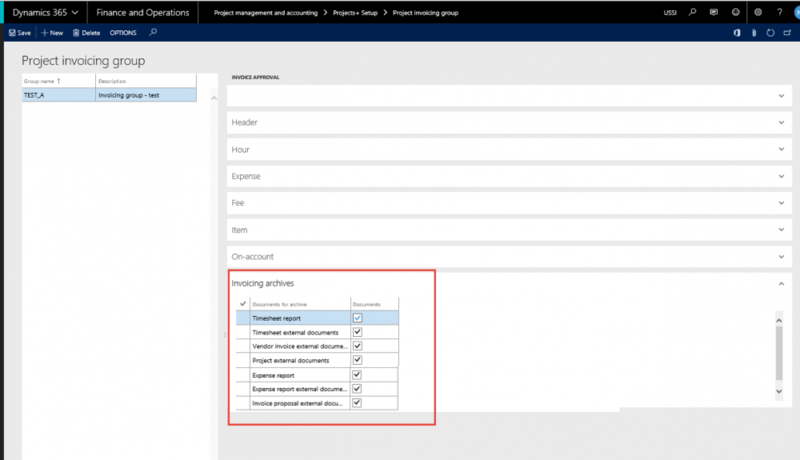 *This section explains the setups required to be completed in order to use the Invoice archive feature effectively. This feature will help the users to attach the document on the Invoice as archive files. There are no parameters which control the activation of this feature, but it has the following pre-requisites. – Document type needs to be configured on the Projects+ Parameter. – Invoicing groups need to be defined. – Document handling has to be turned on with archive path defined in the parameters, in the environment. – Ionic.zip.net dll is installed on the AOS, which helps in zipping files. Note: In case you have any existing invoicing groups prior to this release, the document will not support invoicing archives, so new groups should be created. Invoicing archives section has been added to Projects+ parameters form to setup the document type. Document type fields needs to be selected on this form in order to use invoice archiving feature. Document type in turn will set the document archive path and the other details. Go to Organization administration > Document management > Document type. The Project invoicing group form should be modified to add an additional tab (Invoice Archive) where the documents or reports that have to be archived can be selected by the user. A new fast tab called Invoicing archives has been added as the last tab on the Invoice grouping form. This tab contains the below options which the user could Mark or unmark to include or exclude documents/reports onto the invoice as an archive. This tab is available only when the Ionic.Zip.dll is installed on the AOS, which helps in zipping files. Otherwise, this tab and the checkboxes will be disabled. When the user selects the checkbox, then that document type can be zipped and archived on to the Invoice proposal in the same location as that defined in Document management. Note: The documents/reports that are attached to the invoice proposal would be archived in the same directory as that of the Document management. Thus, there is no option given to the user to store this data separately. Even image files will be compressed to upto 70% of its original size and then archived if there are any.